Deepwater Group (DWG) celebrated more than ten years delivering healthy fisheries at their recent annual general meeting. Established in 2005, DWG was a merger of the hoki, squid and orange roughy management companies, with a mandate for delivering the best-managed deepwater fisheries in the world through progressive management and robust science. George Clement has been their chief executive since inception and said they had achieved many proud moments along the way. “We have helped achieve Marine Stewardship Council certification or recertification for 21 stocks, representing over 70 percent of deepwater catch,” Clement said. 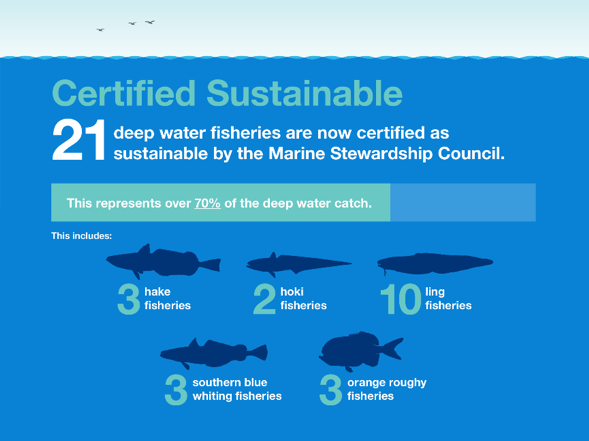 Inshore stocks, albacore and Talley’s purse seine skipjack tuna have also been certified. The quota owners’ direct purchase of science has proven essential in ensuring the information is available to keep stocks in line with their management targets, Clement said. “In the case of orange roughy, in collaboration with Sealord and the Commonwealth Scientific Institute and Industrial Research Organisation, we have developed world-first technology – the Acoustic Optical System. Other crowning achievements included proposing the development of Benthic Protection Areas that now protect 30 percent of New Zealand’s Exclusive Economic Zone, and introducing codes of practice that have minimised fisheries interactions with other animals.